Builders say San Diego isn't building enough homes. 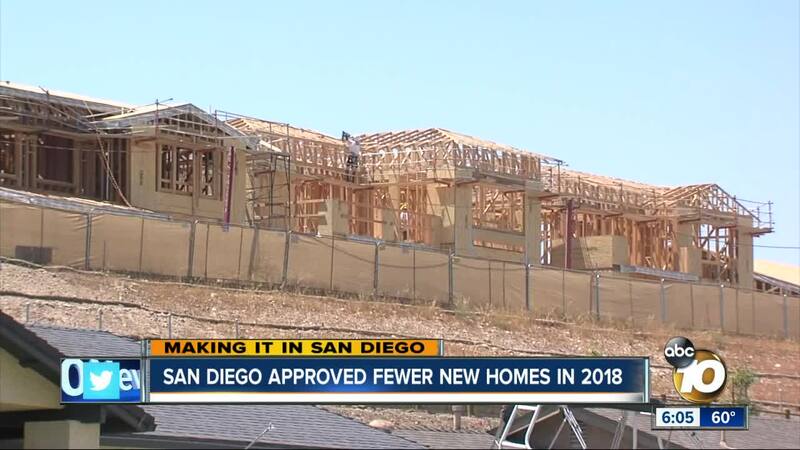 SAN DIEGO (KGTV) - San Diego's building industry is issuing a dire warning about the city's housing crisis, spotlighting new numbers and giving the region's efforts to tackle the problem an "F" grade. "We have abandoned the housing needs of our workforce and our middle class and there are virtually no champions for their cause," Borre Winckel, President of the Building Industry Association of San Diego County, told 10News in an interview. The BIA says that the San Diego region needs to add 14,725 units each year to keep up with population growth. However, in 2018 only 9,575 permits were issued, the third consecutive year that permit numbers declined. Winckel blames state and local leaders for adding to the crisis through over-regulation, particularly environmental regulation. He says they have made building single-family homes so expensive that middle-class families can no longer afford them. He also blames the NIMBY movement (Not In My Back Yard) for preventing projects from being built that would otherwise be approved. The City of San Diego made changes to address the housing crisis in 2018, including amending the city's housing code to make it easier to build homes in commercial zones. Mayor Kevin Faulconer also announced the Housing SD plan, calling for changes to the Density Bonus Program .